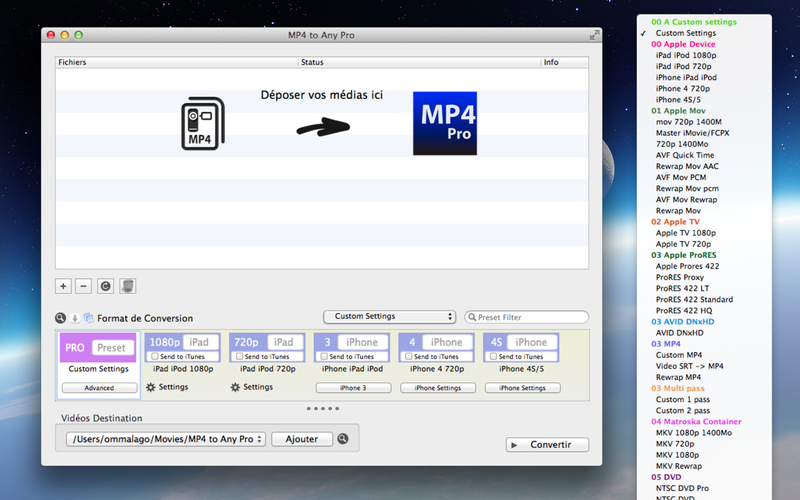 MP4 to any Pro is a power full converter video. You can convert MP4 files to any kind of format with MP4 to any Pro (mkv, mp4, avi, mpeg, dvd, …). 4X Movie X Used in certain computer games. A64 multicolor X Creates video suitable to be played on a commodore 64 (multicolor mode). American Laser Games MM X Used in games like Mad Dog McCree. AMV Video X X Used in Chinese MP3 players. AVS (Audio Video Standard) video X Video encoding used by the Creature Shock game. Bethesda VID video X Used in some games from Bethesda Softworks. Brute Force & Ignorance X Used in the game Flash Traffic: City of Angels. C93 video X Codec used in Cyberia game. Delphine Software International CIN video X Codec used in Delphine Software International games. DFA X Codec used in Chronomaster game. Feeble Files/ScummVM DXA X Codec originally used in Feeble Files game. Electronic Arts CMV video X Used in NHL 95 game. id Cinematic video X Used in Quake II. id RoQ video X X Used in Quake III, Jedi Knight 2, other computer games. Interplay C93 X Used in the game Cyberia from Interplay. Interplay MVE video X Used in Interplay .MVE files. Karl Morton’s video codec X Codec used in Worms games. Kega Game Video (KGV1) X Kega emulator screen capture codec. LucasArts Smush X Used in LucasArts games. Microsoft ATC Screen X Also known as Microsoft Screen 3. Microsoft Expression Encoder Screen X Also known as Microsoft Titanium Screen 2. Microsoft Screen 1 X Also known as Windows Media Video V7 Screen. Microsoft Screen 2 X Also known as Windows Media Video V9 Screen. Mimic X Used in MSN Messenger Webcam streams. MPEG-4 part 2 X X libxvidcore can be used alternatively for encoding. NuppelVideo/RTjpeg X Video encoding used in NuppelVideo files. Renderware TXD (TeXture Dictionary) X Texture dictionaries used by the Renderware Engine. Sierra VMD video X Used in Sierra VMD files. Smacker video X Video encoding used in Smacker. Tiertex Limited SEQ video X Codec used in DOS CD-ROM FlashBack game. VMware Screen Codec / VMware Video X Codec used in videos captured by VMware. Wing Commander III / Xan X Used in Wing Commander III .MVE files. Wing Commander IV / Xan X Used in Wing Commander IV. Zip Motion Blocks Video X X Encoder works only in PAL8. ADPCM Electronic Arts X Used in various EA titles. ADPCM Electronic Arts Maxis CDROM XS X Used in Sim City 3000. ADPCM ISS IMA X Used in FunCom games. ADPCM IMA Duck DK3 X Used in some Sega Saturn console games. ADPCM IMA Duck DK4 X Used in some Sega Saturn console games. ADPCM SEGA CRI ADX X X Used in Sega Dreamcast games. ADPCM Westwood Studios IMA X Used in Westwood Studios games like Command and Conquer. Bink Audio X Used in Bink and Smacker files in many games. Delphine Software International CIN audio X Codec used in Delphine Software International games. COOK X All versions except 5.1 are supported. DPCM id RoQ X X Used in Quake III, Jedi Knight 2 and other computer games. DPCM Interplay X Used in various Interplay computer games. DPCM Sierra Online X Used in Sierra Online game audio files. DPCM Xan X Used in Origin’s Wing Commander IV AVI files. MLP (Meridian Lossless Packing) X Used in DVD-Audio discs. MP2 (MPEG audio layer 2) IX IX libtwolame can be used alternatively for encoding. QDesign Music Codec 2 X There are still some distortions. Sierra VMD audio X Used in Sierra VMD files. TrueHD X Used in HD-DVD and Blu-Ray discs. VIMA X Used in LucasArts SMUSH animations. Vorbis E X A native but very primitive encoder exists. 4xm X 4X Technologies format, used in some games. American Laser Games MM X Multimedia format used in games like Mad Dog McCree. Amazing Studio Packed Animation File X Multimedia format used in game Heart Of Darkness. ADP X Audio format used on the Nintendo Gamecube. AFC X Audio format used on the Nintendo Gamecube. AST X X Audio format used on the Nintendo Wii. AVR X Audio format used on Mac. AVS X Multimedia format used by the Creature Shock game. Beam Software SIFF X Audio and video format used in some games by Beam Software. Bethesda Softworks VID X Used in some games from Bethesda Softworks. Bink X Multimedia format used by many games. Bitmap Brothers JV X Used in Z and Z95 games. BRSTM X Audio format used on the Nintendo Wii. CRI ADX X X Audio-only format used in console video games. Delphine Software International CIN X Multimedia format used by Delphine Software games. Creative Voice X X Created for the Sound Blaster Pro. CRYO APC X Audio format used in some games by CRYO Interactive Entertainment. game and different game cutscenes repacked for use with ScummVM. Electronic Arts Multimedia X Used in various EA games; files have extensions like WVE and UV2. Flash 9 (AVM2) X X Only embedded audio is decoded. FunCom ISS X Audio format used in various games from FunCom like The Longest Journey. id RoQ X X Used in Quake III, Jedi Knight 2 and other computer games. Interplay MVE X Format used in various Interplay computer games. IV8 X A format generated by IndigoVision 8000 video server. LXF X VR native stream format, used by Leitch/Harris’ video servers. FFmpeg metadata X X Metadata in text format. MAXIS XA X Used in Sim City 3000; file extension .xa. MPEG-4 X X MPEG-4 is a variant of QuickTime. MSN TCP webcam X Used by MSN Messenger webcam streams. Material eXchange Format (MXF) X X SMPTE 377M, used by D-Cinema, broadcast industry. Material eXchange Format (MXF), D-10 Mapping X X SMPTE 386M, D-10/IMX Mapping. NTT TwinVQ (VQF) X Nippon Telegraph and Telephone Corporation TwinVQ. TechnoTrend PVA X Used by TechnoTrend DVB PCI boards. REDCODE R3D X File format used by RED Digital cameras, contains JPEG 2000 frames and PCM audio. RL2 X Audio and video format used in some games by Entertainment Software Partners. Sega FILM/CPK X Used in many Sega Saturn console games. Sierra SOL X .sol files used in Sierra Online games. Sierra VMD X Used in Sierra CD-ROM games. Smacker X Multimedia format used by many games. SMJPEG X X Used in certain Loki game ports. Smush X Multimedia format used in some LucasArts games. Sony OpenMG (OMA) X X Audio format used in Sony Sonic Stage and Sony Vegas. THP X Used on the Nintendo GameCube. Tiertex Limited SEQ X Tiertex .seq files used in the DOS CD-ROM version of the game Flashback. Wing Commander III movie X Multimedia format used in Origin’s Wing Commander III computer game. Westwood Studios audio X Multimedia format used in Westwood Studios games. Westwood Studios VQA X Multimedia format used in Westwood Studios games. XMV X Microsoft video container used in Xbox games. xWMA X Microsoft audio container used by XAudio 2.